Safeway’s Croissant Doughnut, available well before the advent of the mythical cronut. With all the recent talk of cronuts – a Brangelina-style portmanteau for croissant donuts – racking up buzz and clicks on the internet, I felt compelled to share with you a treat of similar name that was on the scene WAY before a fancy-pants New York bakery “invented” a hybrid pastry that’s got the fickle foodie popinjays all aflutter. See, the lovely folks at Canada Safeway were selling the Croissant Doughnut long before anyone got all hot and bothered about deep-fried puff-pastry. They’re on trays in the glass-doored doughnut case, next to the rest of the fresh donuts, and they’re just odd enough to catch a doughnut lover’s attention. While I’ve never tried an official cronut, I’ve seen enough photos to know that they’re different from the Safeway variety. 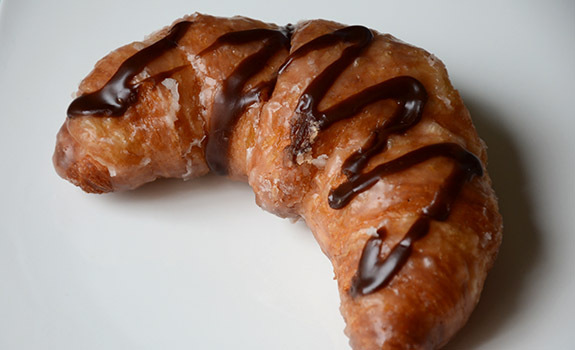 The Safeway ones are shaped like a croissant, they’re deep fried, they’re coated in super-sweet sugary glaze, and then they’re finished off with a lightly drizzled zig-zag line of chocolate glaze. They’re not $5 per unit, nor do they sell for $40 on the black market (not that I’ve recently checked into asking prices on the doughnut black market). These puppies go for $0.65 per croissoughnut. They’re even cheaper if you buy them after 7 p.m. Put that in your cashmere turtleneck and smoke it. The Pitch: Two words: croissant doughnut. If that doesn’t sell it, what will? The Look: Not as big as a long-john. They look more like croissants than doughnuts, until you see the thick layer of glaze. Sometimes they get a bit rumpled-looking. The Taste: Decadent. Soft, oily and sweet. They taste like a Safeway croissant, but with the fat levels amped up and the sugar factor pushed to the extreme. They’re not at all crispy; instead, they’re silky, buttery, oily soft, with a sticky glaze coating that gets all over everything. If you don’t have a napkin or four handy, don’t bother eating one. Cost: $0.65 for a single Croissant Doughnut at Safeway in Calgary. Value for cash money: Great. Nutrition? : Lord knows. I can’t imagine what the sugar/fat damage would be like with these things. Moderation, please. The verdict: While these Safeway Croissant Doughnuts are no doubt very different than the cronuts of internet lore, they’re still worthy of acknowledgement. They’re not fancy, but they’re a guilty pleasure. Long-time reader, first time poster here. I tried this particular item about a month ago and it was indescribably decadent yet viscerally wrong. I regret nothing! Exactly! While I enjoy these decadent treats, I feel like I should be setting a better example for the cashiers. Like when I sheepishly pick up a box of Reese’s peanut butter cereal in a moment of weakness. Although what Safeway has been selling for years is similar to a Cronut, it’s not even close to being a true Cronut, which I experienced recently while on a business trip to NYC. What Safeway sells is a deep fried croissant that’s been glazed with icing and chocolate. A true Cronut looks like a tall fluffy doughnut, and the taste is completely different than the Croissant Doughnuts that Safeways sells. Trust me. So in this week’s Safeway circular in California they have Donut Croissants on sale. And they look like donuts! Not like the pic above. 4 for $5. I can take a pic if you want. Sadly with the sale of all the Safeway stores on Vancouver Island to Overwaitea we can no longer buy these sinful delights anymore. Save-On-Foods was making them still for about a month after the changeover, but not anymore, sniff. Sour cream fritters are not the same! I wish I could bribe one of the old Safeways bakers for the recipe. I guess we have one more reason to go to the Mainland. I used to work at a grocery store in NH in the 1980’s (Alexanders) and we had croissant donuts, they were our best sellers. The dough came in frozen, was thawed and proofed and then fried (like the handmade donuts) and then glazed, they were very yummy! I’ve been eating these LONG LONG before the Cronut fad. And I actually tried the famous Cronut — thinking it would be better than my Safeway guilty pleasure. But I was actually wrong. I didn’t enjoy the Cronut as much as these Croissant Doughnuts. The Cronut was WAY too oily and rich, that after 2 bites I had a major stomach ache and threw the rest away (even though I spent 7 dollars on one! ).